Can family and friends come too? Yes. Families and friends are welcome to join us, and many have done so in the past. Parent packages can be customized to suit whatever type of experience you’re looking for. Please contact Coach Quinn, if you are interested. *The only part of the camp that is (usually) not available to parents is the team bus, or team vans. We do our best to create a college / professional team feel. Planet Baseball players come from all over the U.S. and Canada. The guys are with their local teams (high school and travel ball) before and after the trip. Can I join Planet Baseball? Yes. Our trips are open to any and all sophomore, junior, and senior high school players. Is it safe to travel where you guys are going? Yes. SAFETY IS OUR NUMBER ONE PRIORITY. We stay in, and travel through safe places (where we have been many times before)… and our staff members are with the team on and off the field. Many players and families have that same thought. These trips are an amazing baseball & life experience…and a huge confidence builder, even for those that have plenty. Join us for this adventure and you will be rewarded greatly. Do you have any fundraising options? 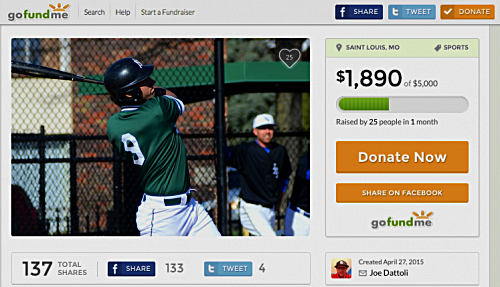 Many former Planet Baseball players have been successful fundraising with GoFundMe. It takes just a few minutes to set up an account, and your friends and family can track your progress as you collect donations through email, facebook…etc. What is the cancellation policy? Can I get a full refund if I decide not to go? To reserve a spot at a Planet Baseball camp there is a deposit in the $750 - $950 range (the amount will vary depending on camp location). The deposit is non-refundable (but can be saved and used for a future camp with us). If the full amount has been paid, and there is a cancellation (before the camp), you will have the option to receive a refund (of the difference between the overall cost and the deposit payment). The full amount can also be saved and used as a full credit for a future trip. Once a camp begins, we cannot make any refunds or offer any credits. Can Planet Baseball camps help me get a college baseball scholarship/roster spot? Our intensive week-long camp gives players a preview of next level baseball coaching, helping them to take all aspects of their game to the next level. The skills players develop on our trips are likely to impress coaches and scouts. Yes. If a player has a parent / guardian with them (or has permission) he may meet us at our starting point, or stay behind after the camp has been completed. The cost of the camp will remain the same unless the early arrival/late departure costs more than the originally intended flight plan. In that case Planet Baseball asks that the player / family pay the difference in cost. If you like the idea of great coaching, competition, and adventure (and there are roster spots remaining) you are welcome to join us. A valid passport is all you need (no passport needed for Puerto Rico! U.S. Territory) We will remind you… but please make sure that it’s updated well before you fly. It can take a while to get a new passport (or renew an old one). For passport information, refer to http://travel.state.gov/passport/passport_1738.html. It usually takes 4-6 weeks to get a new passport…so apply well in advance of your trip. If necessary (for an extra cost) you can get your passport in 2 weeks or less. We stay in hotels. Nice places. Safe / good neighborhoods. Two or three guys in a room. Everybody has their own bed. What happens if my son gets hurt, or gets sick while traveling in another country? Planet Baseball purchases international insurance for all players traveling. In addition, our staff has mapped out medical facilities in all locations in case of emergencies…but it would be wise to check your insurance plans, so that you know ahead of time what you are already covered for overseas. Will we receive pictures and videos after the camp? Yes. We will be posting a lot of pictures and videos on Facebook (Planet Baseball) & Instagram (theplanetbaseball). All will be free to download. Will there be a “Game Tracker”? We usually send daily game and travel updates, but don’t do a "game tracker". We have found that our guys play better & make greater gains with our coaching staff during the trip, when they’re not worrying about their stats. My son plays travel baseball…is it wise to leave the country for 2 weeks, and miss games / showcases / tournaments? Coming from experience, coaches will understand if you miss a handful of games (or an event). This is a once in a lifetime experience, and players will be receiving elite level instruction. The cost will vary depending on trip location & events, but we keep it as low as possible (while still giving a full cross-cultural experience). Will my son be given a talent evaluation? (that we can send to college coaches? We usually don't do formal evaluations. From our experience (as college coaches & pro scouts), next level coaches don't want to see evaluations. ...because they are usually biased & inflated. Coaches want to see recent video, school grades, standardized test scores...and references to contact if they have interest in a player. We are more than happy to be a reference for players who have been a part of our camps. ...and we will be providing feedback (coaching) to our players about what they can do to improve their chances to play next level baseball. The trip tuition covers all expenses while traveling with Planet Baseball...but but most guys will bring a little extra cash for extra snacks, drinks, and souvenirs. What currency will be used in the cities I am visiting? How do I exchange money to the local currency? The two best options are exchanging money at your local bank, or bringing a (reloadable) debit card to make ATM withdrawals. Both options will give you very good exchange rates. Will my cell phone work internationally? How can I communicate with friends and family back home? Check with your service provider. Some phones work like normal overseas...but if not, you can purchase an international plan with your service provider. Another great (and free) way to communicate with friends & family back home is via text, email, WhatsApp, or other free messaging options (when we have a WiFi at the hotel, restaurants…etc). Team flight info will be posted on the Europe website page ("DESTINATIONS" section). We will meet at the airline check-in counter 3.5 hours before our flight. Please allow plenty of time on both ends of the trip, so that you won't miss flights if there are delays. Planet Baseball coaches will meet you at the airport when you land (unless you're flying with family...then we will meet you at the team hotel). We will be tracking flights, texting, calling...etc. It's a very small airport, but please wear something RED (shirt or hoodie), so that you are easy to recognize. We will meet, and have dinner @ 7pm the night before we fly to Havana, Cuba. Please plan to arrive in Miami in the morning or early afternoon, in case of any flight delays. Occasionally, players will come with a friend...but usually all of our guys are traveling solo. Definitely a little bit of an adventure, but our guys have an incredible experience and make friends / bonds that last a lifetime. This a great baseball trip…and and incredible life experience. I'm traveling with a friend. Can we room together? Are all meals covered during these trips? Yes. The cost of the camp includes all meals from start to finish. Does Planet Baseball have a 'Code of Conduct' ? Yes. Players and parents receive the "Planet Baseball Code of Conduct" before our trips begin. Most importantly, illegal and/or dangerous behavior will not be tolerated. If there is an incident, the Planet Baseball staff will determine the level of severity, and then decide what is in the best interest for the participant and for the group. If an incident is severe enough, or if there is repetitive misconduct, the participant will be sent home at the expense of his family. The drinking age is lower in other countries. What is Planet Baseball’s alcohol policy? No alcoholic beverages (or illegal drugs) are to be consumed at any time. Most importantly, illegal and/or dangerous behavior will not be tolerated. To call internationally from the US you must dial the country code (easy to Google), then the phone number. To dial to the US from abroad you must first dial +1, then the phone number. Can I purchase a Planet Baseball hat, shirt, or jersey for a family member? We don't have a Planet Baseball store / shop...but we always have a few extra items available for family and friends. When should I arrive (or depart) SJU Airport in Puerto Rico? What does my son need to bring with him? *Laundry (BASEBALL CLOTHING) will be done after every 2 games.